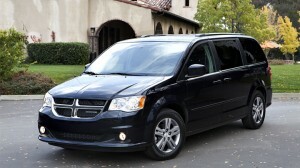 The best minivan is back with the Dodge Grand Caravan. With a design that shows an attention to detail in every aspect, the Grand Caravan is just begging for you to give it a spin. Sporting some new exterior features, the fifth generation of mini van is looking to make sure that the stereotype of the minivan that looks don’t matter but this vehicle doesn’t accept that. It dismisses those claims with a sophisticated look. With a newly designed front fascia and the signature Dodge crosshair grille it couldn’t be more clear about the care put into making sure that there is no sacrifice of style for the care of the family. This is truly the vehicle for every family, clearly seen in the luxurious interior. It’s a good thing it can seat up to 7, with the quality seating being offered it’s hard to see why no one wouldn’t want to climb in for a ride. The seats have improved fabric material and the interior is designed with soft touch materials to make sure comfort is always there. It doesn’t hurt that the front and second row seats are heated. It even has a super console available that offers not only 4 cup holders, but also two power outlets, and is an accessible storage area. The Grand Caravan is all about room. It has the room for the people who ride and for the family that needs the space for their outing into the countryside. The second row seats can switch from being seats for passengers into quickly being additional storage space with the simple touch of a button. The third row can follow suit with the one motion system that now allows the head rest of the chairs to fold down giving even more space! There’s also the available Mopar cargo liner to make sure that whatever you’re packing into the Grand Caravan won’t destroy the seating. There’s even a Mopar running board that is made from high strength and durable substruction that makes it so they can take a beating no matter what kind of shoes are stepping on it. Grand Caravan is all about providing an unparallelled amount of comfort. For those far trips to the relatives, you can get a 9 inch flip down color screen so your kids can watch their favorite DVDs. If you were worried about the noise becoming too much while you’re driving or just trying to sleep, you can also get two wireless infrared headsets so they can still enjoy the show while giving you the quiet you need. There is even the Uconnect System, Dodge’s way of linking your Grand Caravan to today’s tech. You can use it to turn your minivan into a mobile wi-fi hot spot. The best new addition to the Caravan is the new 3.6 liter V6 engine that is all about giving minimal maintenance with great durability. It provides 283 horsepower and 260 pounds-foot of torque. All that power and it still manages to deliver fuel economy that could only be called incredible. That’s 17 miles per gallon when driving to the kids soccer game in Brooklyn and 25 mpg when driving out to Hudson Valley for the weekend on a 20 gallon tank. That means you’ll get an estimated range of 500 miles on the highway. To make the deal even better, the V6 engine has been tested and now when you push down on that gas pedal, you’ll get quality and smooth operation. Dodge wants to make sure that your family is well looked after with the Grand Caravan. The vehicle comes equipped with airbags spread throughout the cabin. This includes driver and front passenger airbags and supplemental side curtain airbags. The frame of the car has been reinforced and is designed to absorb the energy of an impact to make sure that every passenger is safe. There’s also an available Parkview camera to make backing up even easier through the use of audio and visual indicators when backing up. This entry was posted in Bayside Queens, Dodge Grand Caravan, New Car, Used Car and tagged Bayside Queens, Dodge, Dodge Grand Caravan, MOPAR, New Car, Unconnect, Used Car by baysideadmin. Bookmark the permalink.